Where in the world is cloud storage essential? It turns out to be in some places that surprised some of our team members. 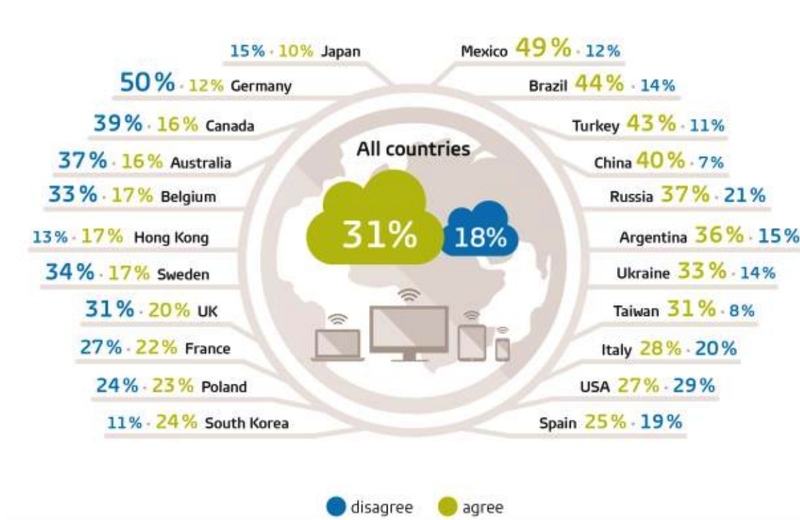 In a recent study, research shop GfK asked internet users in 22 countries about how strongly they agree or disagree with the statement: “it is essential for me to access or store my photos, documents, music, and other content in cloud” (with cloud defined as “ secure Internet location that you can access from any location or device”). When GfK looked at the results across the different countries represented in the survey, Mexico was the clear cloud leader, with almost half (49%) of its online population giving top-two agreement that the cloud is essential for them. Mexico is followed by Brazil at 44%, Turkey (43%), China (40%), and Russia (37%). Argentina. The strong representation of the Latin America countries included in the survey didn’t surprise our partner development team (they’ve been working with leading internet solutions providers in those countries to enable our cloud backup, sync, and sharing tools).